I love Christmas shopping (and if I’m honest, I love all shopping). I find it exciting to look for deals starting the day after Thanksgiving (who doesn’t love Black Friday?) and fun to buy gifts throughout the year. My husband doesn’t start shopping until 2 weeks before Christmas and he doesn’t buy anything except for exactly what’s on people’s lists. Some people start planning their gift purchases with excitement and go all out, while others think about buying gifts for the holidays and it fills them with anxiety and dread. Regardless of your gift buying strategy, it’s important to consider finances and your budget, particularly if you’re in a relationship. Make sure you and your partner are on the same page about holiday finances, so you can avoid conflict about finances. Money is one of the biggest areas of conflict in marriage and it can be one of the most difficult to work through. This is because there are often so many emotions and meanings tied to money – feelings of self-worth and accomplishment, feelings of entitlement or fear of scarcity. Money is a tangible thing so during conflict people often think there is a right or wrong answer. However, the same rule applies to arguments about money as to any other conflict – it’s all about listening, understanding the other person’s feelings and perspective (even if you don’t agree) and offering up solutions and compromise. Conflicts about money can be so intense and add that to holiday stress – you have a recipe for relationship disaster. 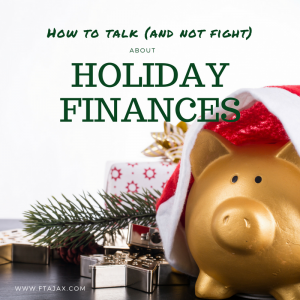 Before you panic, take a deep breath and see our suggestions below on how to navigate finances during the holidays without ruining your holiday spirit (or your relationship). Consider your views about money. Consider where you and your spouse come from. Growing up in a family that has an abundance is very different than growing up in a family that struggles to make ends meet. Think about cultural differences if there are any and how this might influence how you or your partner view money. Discuss these thoughts with your partner. Ask their thoughts. Money means different things to different people – freedom, security, power, respect, stress, fear or love, among other things. These are all important feelings and values. Most people feel pretty convicted in their views about money. If money means financial freedom and security to you, it’s likely you’ll feel very anxious thinking about spending money. If money and gifts are a way you show love and admiration, you might feel hurt that your partner doesn’t want to spend a lot on Christmas gifts. Both views are valid and deserve to be heard and thoughtfully considered. Take time to listen and consider your partner’s perspective and ideas – even if you don’t agree. No one’s view is right or wrong but rather the way they see things in their world. Make an effort to understand where they are coming from. Respectfully, express your viewpoints. Take some time to think about what each of you has shared and consider possible solutions. Set aside a time to come back and share your ideas – look for a place of compromise. Decide on rules or a budget that you both feel comfortable with. Consider what kind of support you might need sticking to the budget. Perhaps you need to keep all receipts together, disclose purchases or dollar amounts you spend to your partner, or shop only with cash. Don’t be afraid to ask for help or talk about your struggles with the budget. Remember, you are in this together as a team and your partner is there to support you. What can you change for next year? Think about what you learned from your discussions and budget this year. What can you do better next year? Perhaps you decide on a new savings plan, shop slowly throughout the year or use a designated credit card with rewards for holiday shopping. Again, be open to your partners suggestions and thoughtfully consider their feelings. The bottom line is, no matter how you feel about money, remember the true reason for the holidays. It’s more important to preserve your family, budget and sanity than it is to buy the best gifts. Experiencing peace, happiness, and quality time together is a much greater gift than material things. If you find that money is constantly a point of conflict in your relationship during the holidays, or anytime, our relationship experts specialize in helping couples communicate effectively through conflict. Ready for more peace and happiness? Get started with an appointment today.